Money can be an uncomfortable topic for brides and grooms to discuss with their respective parties. Traditionally, bridesmaids and groomsmen do pay for their own attire—dress or suit and tie, shoes, and everything in between. However, while your vision as the bride or groom is important, it’s also crucial to remember that being in a wedding is an expensive honor! If you know money is tight for your crew, here are some easy ways you keep costs manageable for the ones who have graciously agreed to stand by your side on your big day. Using rental companies is a great way to make your dream wedding a reality. Suggesting that your wedding party rent their attire is especially thoughtful if you’re requesting they wear a floor length gown or formal tux. Sometimes companies like Men’s Warehouse will even offer perks when you rent 5+ suits, so don’t be afraid to ask! 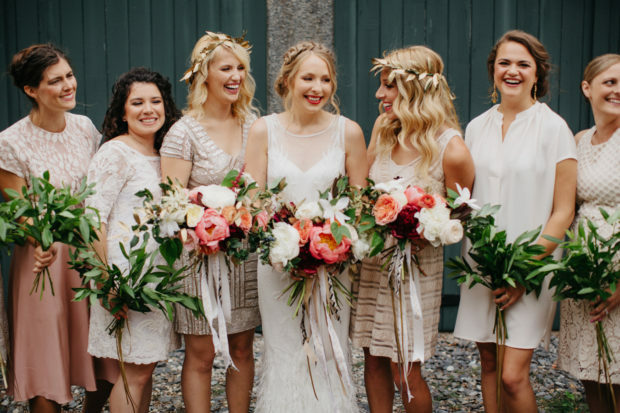 Allowing your wedding party the freedom to choose what they wear is a great way to lessen the blow of wedding expenses—it frees your wedding party to spend whatever they feel comfortable with, and hopefully choose pieces they’ll wear again. There are a few ways to approach curating a mix and match look. For inspiration, we’ve included some images of wedding parties we think nailed this look. For the guys, it’s fairly straightforward. If your groomsmen already have a suit in the color you have in mind, let them wear it! To ensure a cohesive look, you can simply request that they all buy the same shirt, tie, or shoes instead. There are a few routes you can take to achieving a cohesive mix and match look. Forgo the traditional dress or gown. If your ‘maids already own a dressy skirt they love, let them wear it! Ask them each to wear the same top instead. Even if you’d prefer that your wedding party purchase the same pieces, separates are often a less painful splurge, since they’re easy to repurpose for other events. Allowing bridesmaids to choose a dress of their choice within a specific color scheme is a common and simple way to let each of your bridesmaids spend exactly what they want. If your party is wearing short dresses instead of long ones, matching shoes can tie the look together. If you want all of your bridesmaids in identical gowns, don’t limit yourself to what’s marketed as bridesmaid attire. Affordable retailers like ASOS and Lulus often have a large selection of long dresses and shorter cocktail dresses available. Remember, it’s entirely possible to dress your squad like a million bucks without spending a fortune—you just have to think outside the lines.